One Big Yodel: Long Live the Ampelmann! So much of Berlin seems to have tried to rid itself of its past, or is still figuring out how to deal with it. But they have left up the light signals from the former east and west, so you can still clearly see when you’re walking over the now mostly non-existent Wall. 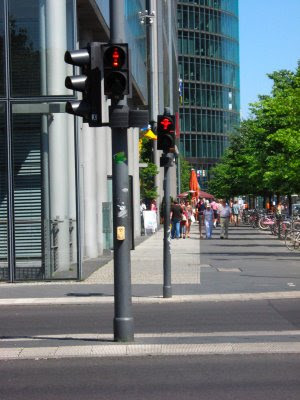 This failed to lose its allure for me, even after three days in Berlin, so I have many shots of the so called “Ampelmännchen” (little traffic light man—what a very German word indeed). In this photo you can clearly see the two different lights—the generic one from the west, and the 1961 designed Ampelmann from the east.